Monday, November 24th: With only six contenders left in the house Big Brother reveals who has been hiding what. From nominations and betrayals to rewards and power plays. Tuesday, November 25th: Eviction. Six housemates are trimmed down to a final three with the Grand Final only 24 hours away. Wednesday, November 26th: Grand Final. Three housemates will become two before the winner is announced. Preliminary television guides suggest the finale will air from 8:30 pm local time in each state. This will mean the winner announcement will be delayed by time zone differences everywhere – including BB’s home of Queensland – and live in New South Wales, Victoria and Tasmania. This is despite the 2013 Finale making television history of broadcasting live everywhere except Western Australia and the Northern Territory. 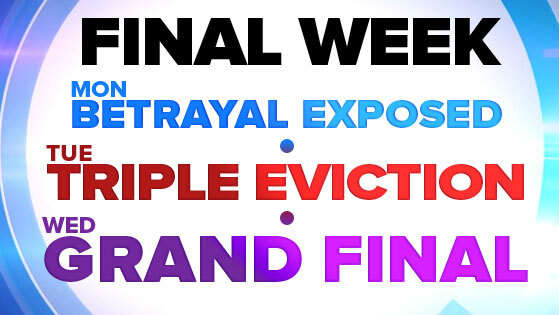 In an interview on Mike Goldman’s podcast, Alex Mavroidakis reveals the Finale will include the housemates watching the show along with Australia, including a look back at the news events that have been going on throughout the 80 day season. There will be “some form” of flashback of iconic moments that made Big Brother Australia over its 11 season history, and the winner’s announcement will occur while the final two are inside the house. Tickets to the Grand Final went on sale today. If they are placing a “Flashback” (Tribute) that probably means it really is the last year of BB on Network Nine, due to the fact they did the same thing in 2008 with a huge tribute to the show which ended up being the last year of BB on Network Ten. I don’t think this means anything, it might be a false rumour, about the flashbacks of iconic moments that made bb over the past 11 seasons. I hope it’s not a rumour! It needs to finish and finish stat! Then again it’s eleven seasons of an ongoing show. Rarely does a show gets to be on the air that long unless your Neghbours and Home & Away. It truly deserves getting a look-back. Bye bye …Alex single handily ruined BB. I’m glad they are doing the Flashback. It will show people how downhill BB went and how great it used to be, especially if Skye or Priya win. the flashback things isnt a rumour. Ive listened to an interview podcast and heard Alex say it himself. Shocked to see so many people making racist posts on BB Facebook page which aren’t deleted by BB but when I post that Australia shouldn’t hate the players for their race MY posts are deleted? This season is so edited, right down to their social media sites. Channel 10 was much better at making the series diverse, in terms of race, age, intelligence, etc. being the last year of BB on Network Ten. Is there a way I can somehow connect my old comment to my account so it’s saved as mine? It was connected with the same IP when I posted it if that’s good enough proof.